I grew up on these in Australia, and my kids love them. Place butter, honey, and sugar into a small saucepan, and stir over medium heat until butter melts and the mixture becomes frothy. 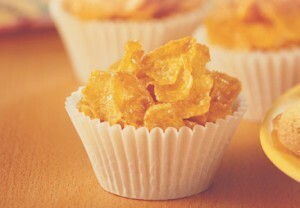 Place the cornflakes in a bowl that can withstand heat, and pour in the honey mixture and stir well. Place spoonfuls of the mixture into prepared patty cases. Bake for around 7-8 minutes. Make sure they do not start to go brown. Stand for around 15 minutes to allow them to firm up and cool down.